Bring learning to life with a visit to one of our parent-recommended museums and experiences. For a delicious, immersive visit into the world of chocolate, take a guided tour at York's Chocolate Story. 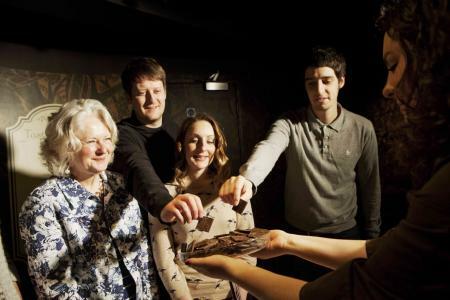 Discover the history of chocolate and British chocolate-making families in an interactive tour, complete with tasting opportunities (and plenty of them! ), hands-on chocolate making and the wonderful, sweet smell of everyone's favourite confectionery. Elena Dalrymple visited York's Chocolate Story with Kate, 10, Tom, 7, and Emily, 3. You'll start your journey by travelling back to the rainforests of Central America, home to the cocoa bean and the very first chocolate wars. After tasting the (rather watery!) chocolate drink favoured by the Mayans and the Aztecs you'll hear about York's Quaker merchants, chocolate's "founding families" who made British sweets and chocolate world-famous. 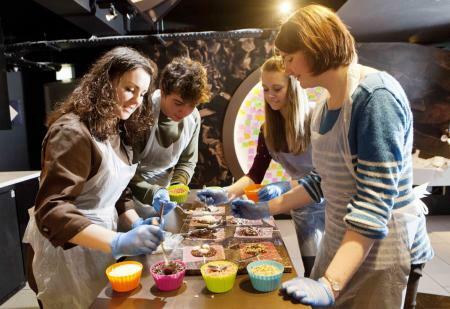 Then it's time to get hands-on with the Virtual Chocolate Factory, have a go at making your own bar and watch a chocolatier at work producing shiny, delicious chocolate morsels. The frequent tasting opportunities (of course! ), as well as the chance to have a go on the Virtual Chocolate Factory, 'toasting' and 'grinding' beans into nibs, 'tempering' chocolate and 'pouring' it into moulds, all by pushing levers and buttons and watching the effect on the virtual chocolate. The invitation to make your very own chocolate bar (with bowls of sprinkles to choose from) was very well-received, too! 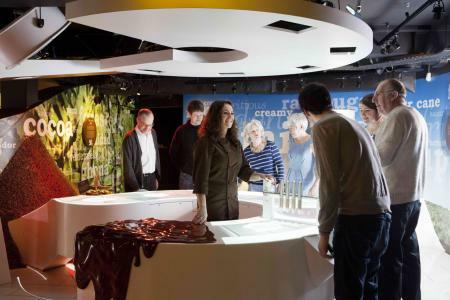 The guided tour features a number of atmospheric sets − we loved the Central American rainforest and the talking portraits of York's most famous chocolate entrepreneurs (very Harry Potter!). The interactivity, small group size and personalised commentary from a tour guide meant that even young children were mesmerised by the experience. Learning how to taste chocolate like a professional (the kids' equivalent of wine tasting, expressing their 'expert' views will keep them amused for ages!) and finding out more about the evolution of their favourite brands and variants (Smarties, KitKats, etc). Watching a real chocolatier create a chocolate shell, fill it with fruit purée and then use a running-chocolate tap to close it up was also pretty entracing (especially as we were allowed to sample the results!). The seasonal exhibitions, packed with chocolate manufacturing memorabilia. School holiday events are an added extra (included in the admission price), from chocolate festivals and Easter egg hunts to exhibition trails, seasonal treats and hands-on decorating activities. The on-site cafe sells all manner of chocolate drinks and treats. There is no eating (unless you count chocolate tasting) inside the exhibit, but pedestrianised King's Square, just outside, has a few seats and walls to perch on if you want to bring snacks from home. York's Chocolate Story is in the heart of the city centre in King's Square (top of the Shambles). Open daily, 10am-6pm (last tour at 5pm); tours start every hour. Closed 25 December and 1 January. Admission: Adult £9.95, Child (aged 4-15 years) £7.95, Family of 4 £29.50, Family of 5 £35.00, Under-4s free. Special offers and discounts are available if booking online; if you're planning to vist more than one York attraction it's also worth investigating the savings offered by a York Pass. All visits are guided, so it's worth booking in advance to ensure you get a place on the tour you want. More chocolate than you can imagine, from gourmet, bite-sized chocolates to very, very large bars. Stock up! Download free factsheets about the history of chocolate and its journey from bean to bar and make a no-cook chocolate tiffin. Download a Chocolate Landmark Trail (covers York city centre) before you visit to expand your child's understanding of the chocolate business and how it affected the city.